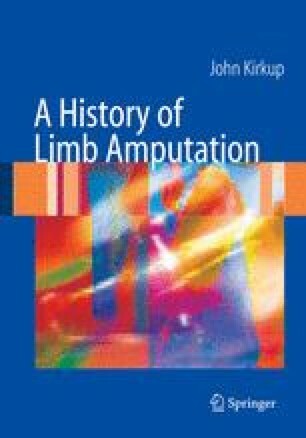 In describing limb loss, alternative terminologies are noted before the word amputation was established in English at the beginning of the 17th century. Since then, written evidence of elective amputation is cumulatively enormous, stimulated initially by the impact of gunshot wounds. However, the long preamble of natural amputations and nonsurgical amputees, extending back to prehistory, has received little consideration and is developed further. This chapter reviews selected written sources reflecting historical perspectives, recognising this is incomplete.Attention is drawn to numerous alternative procedures introduced since the end of the 18th century to avert amputation and to certain societies who oppose amputation for religious reasons.